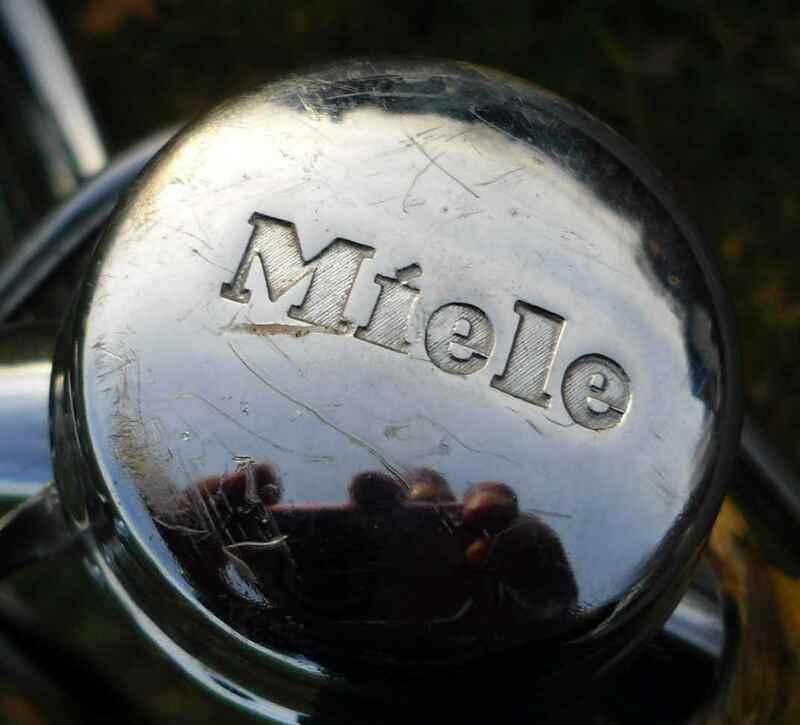 Being blessed with glorious spring weather and some free time I took the newly restored Miele Model 112 for some rides last week. 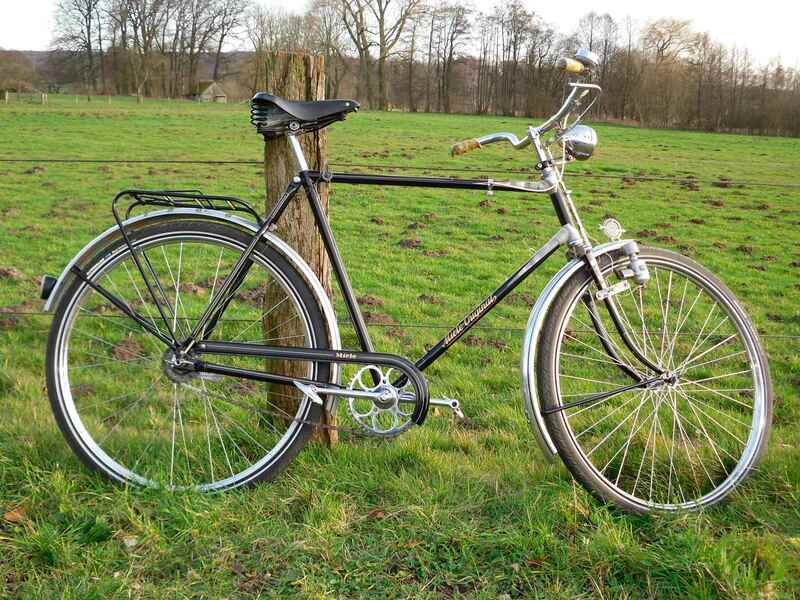 First I undertook a longer shakedown ride (which revealed that I will have to do some more work on the three speed). 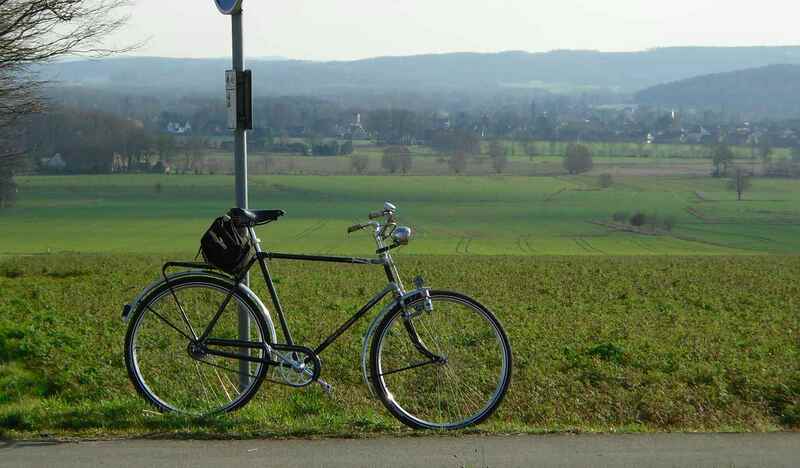 A few days after that there was this season´s first ride in the RTF series (which revealed that I really have to do some more work on the three speed). 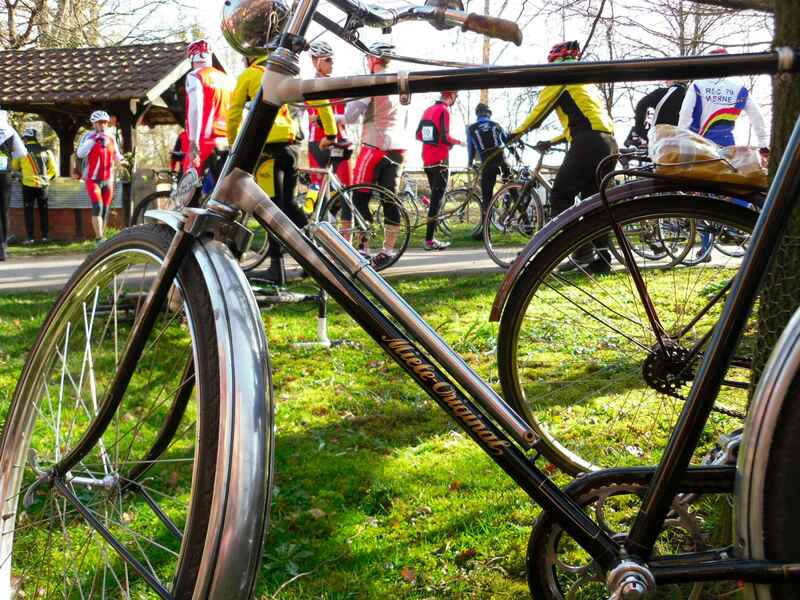 I decided that about 80 km was enough, not having done any winter training at all, and I just enjoyed the bike, the ride, and the good company. It took me about four hours to complete the nearly 80 km, two feeding/control stations, some stops for photos and one to help a rider out with a decent pump. 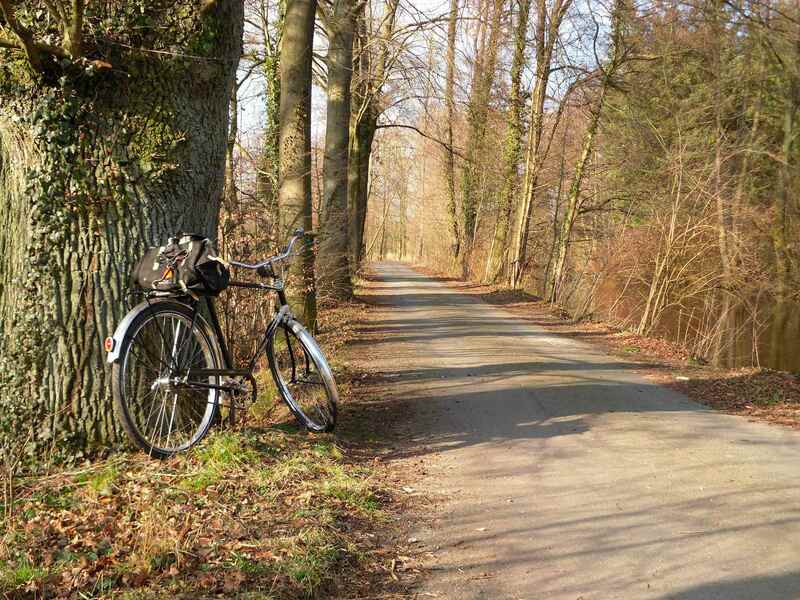 The bike rides nicely, it can actually be quite fast and you don´t even have to push too hard. I think the alloy rims contribute a lot to this effect with the originals being heavy painted sheet steel. Also I appreciated the fat tires (original size) on the predominantly bad roads. 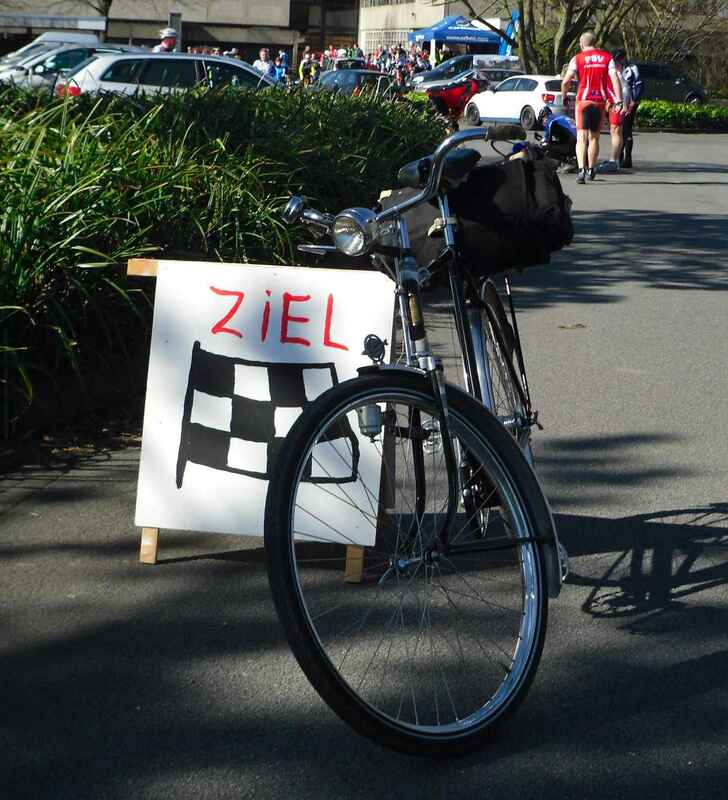 Just when I leant the bike to the sign saying “finish” and pressed the button on the camera, there was a loud noise – two unattentive cyclists had crashed into each other, not at any considerable speed, but at least one of them was lying in the road in pain for quite a few minutes. You can see other riders looking after him seconds after crashing. On the way I encountered some sort of diesel engine or tractor museum – can´t really say as it was closed. The diesel monsters in the parking lot were impressive, though. There´s times I envy Californians their weather, and there´s times I don´t. Classicrendezvous – who could do without it. 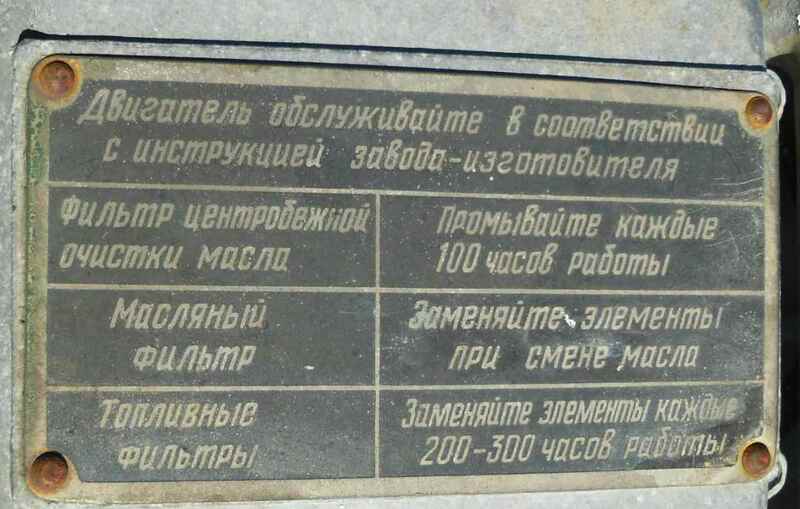 People say there has been the possibility to post pictures – I have yet to see, or find out how to post one, however. 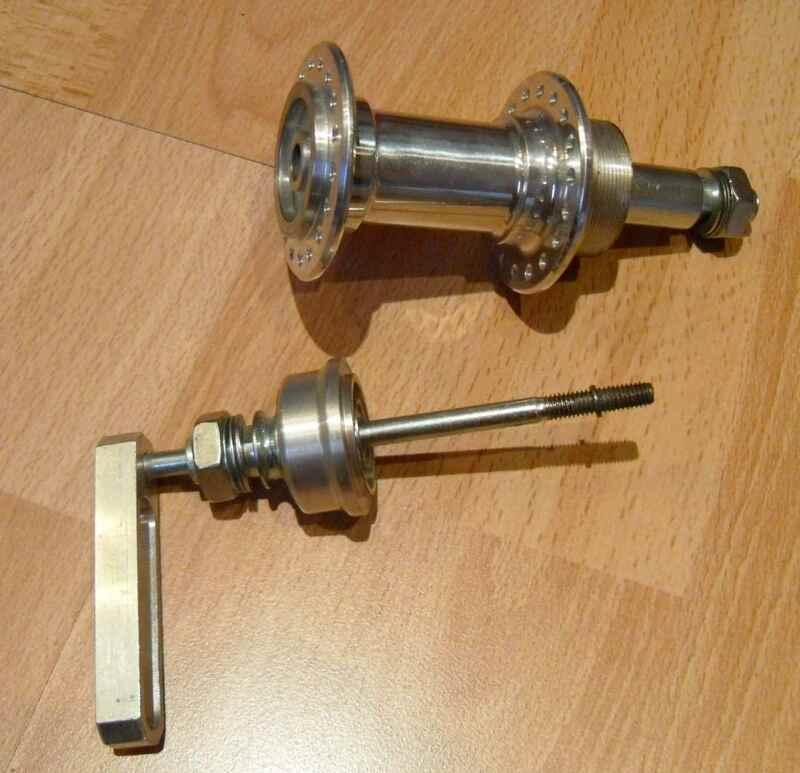 There has been a recent discussion about bivalent hubs – here´s one which is special and which people most certainly haven´t seen before. 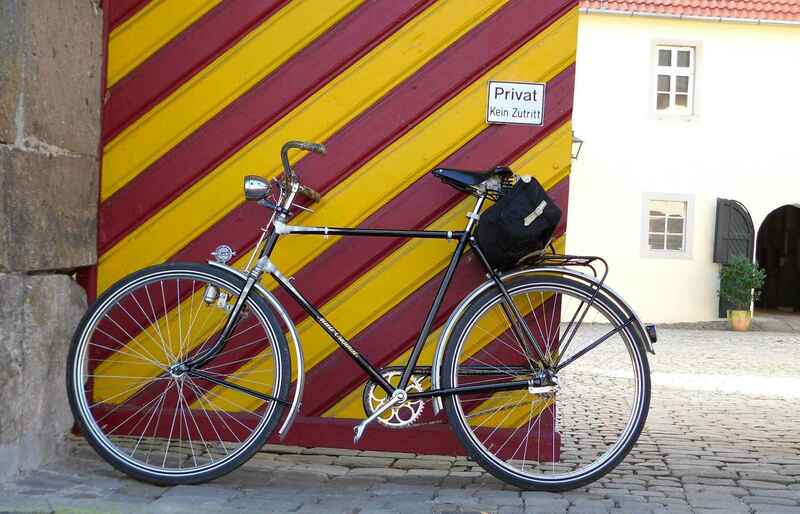 It is a WECO prototype given to my by the firm´s owner years and years ago when I visited the premises. As I don´t know how to show my hub to CR members, I´ll have to take the detour of my blog. Besides, this approach should net another half dozen of clicks. 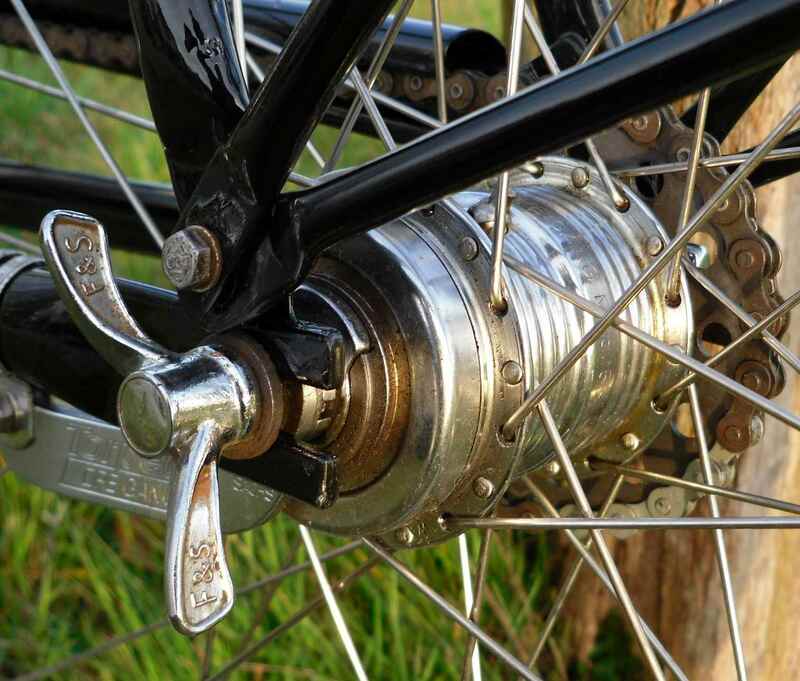 WECO (Wehmeyer & Co) were known for decades as furnishers of cheap, but reliable bicycle components, mostly to do with bearings – hubs, pedals, but also roller-skates. 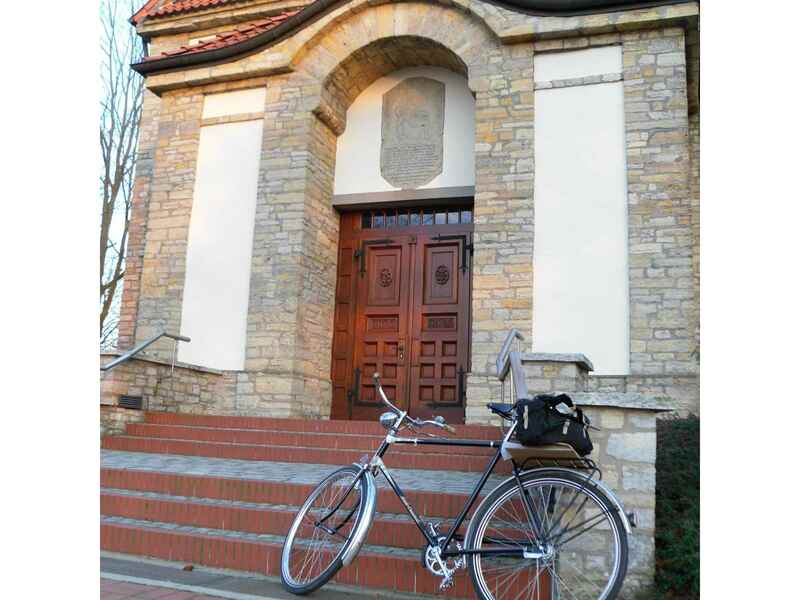 They were situated near Bielefeld and supplied their products to the local cycle works. 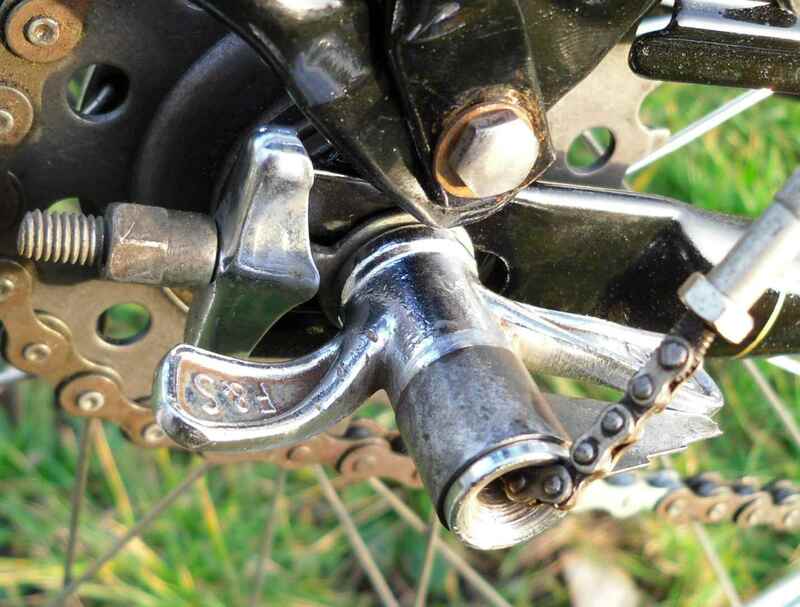 You fix the wheel to the frame with the help of the hex nuts – the seeming q/r lever isn´t one; it is turned to unscrew the hub from the smaller part which stays in the frame. 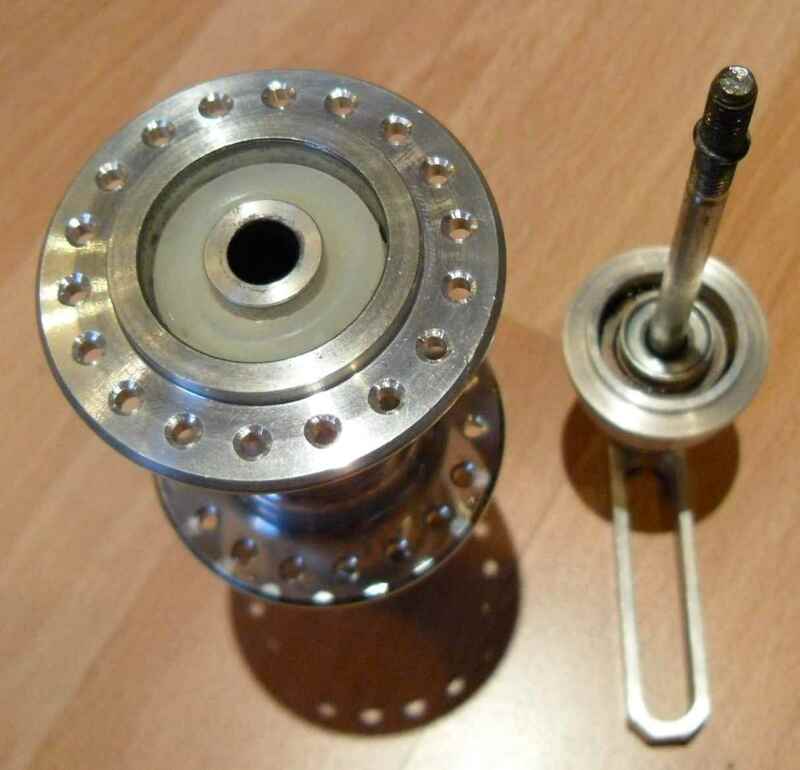 The hub is of all annular bearing construction. 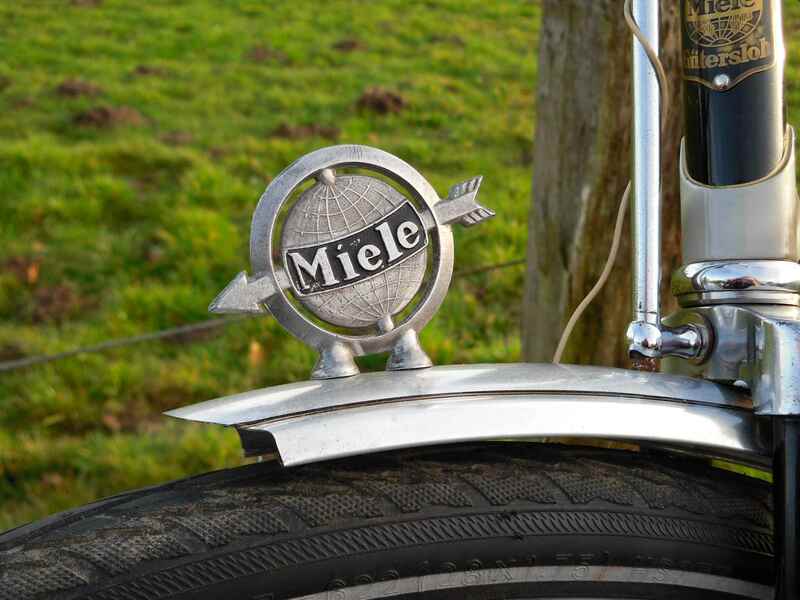 Last year, on the Friday before Whitsun, to be precise, I was able to buy the remains of a Miele Klasse 12 Model 112, meaning a Miele Original roadster in 60 cm frame height. I usually need around 65 cm, so this I felt was a step in the right direction, keeping in mind that 55 cm is to be found on 95 per cent of bikes from that era. I decided to restore the bike, or rather, make a complete bike out of the sad remains that were still there. I also decided to use some lightweight parts – to my mind they look better, and wheels with alloy rims ride better when ridden fast. 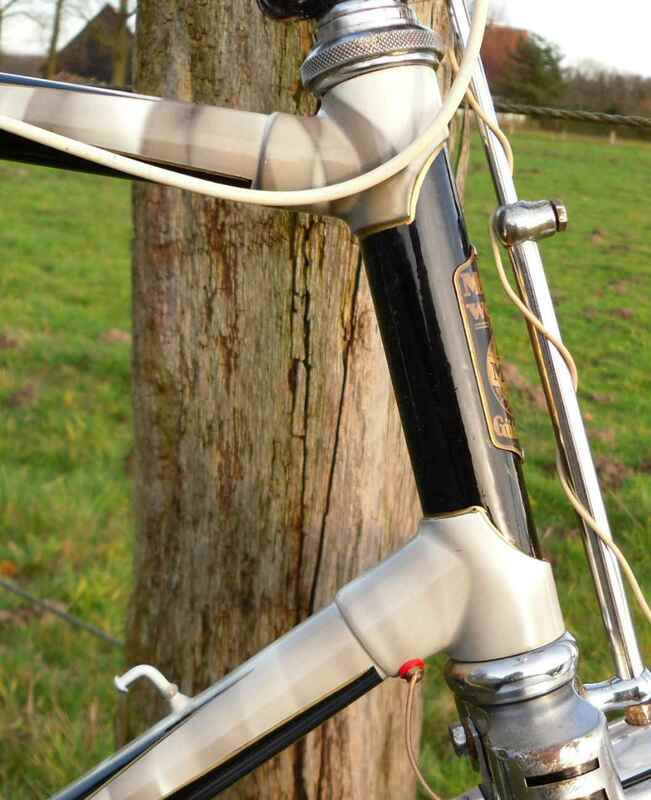 I was lucky to be able to score a set each of alloy rims and the mudguards in the right size (28 x 1,75). 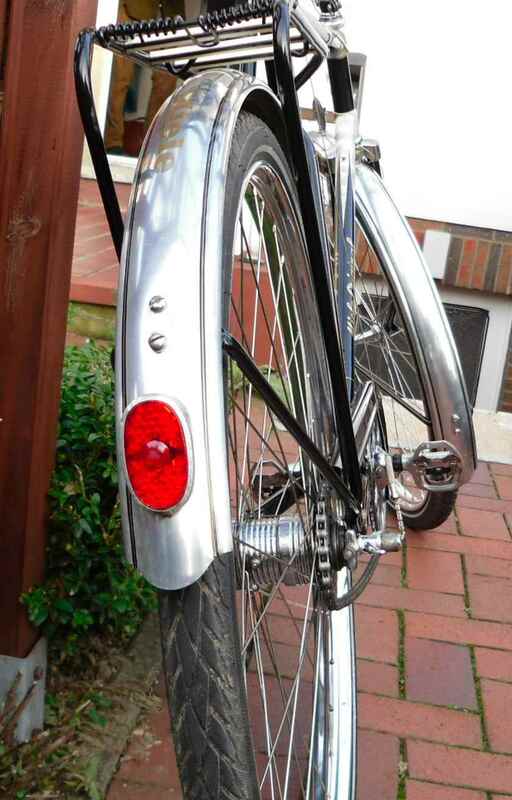 Also I was very lucky to be able to buy a 26″ bike with a bad frame but really good chrome and the elusive rear light. 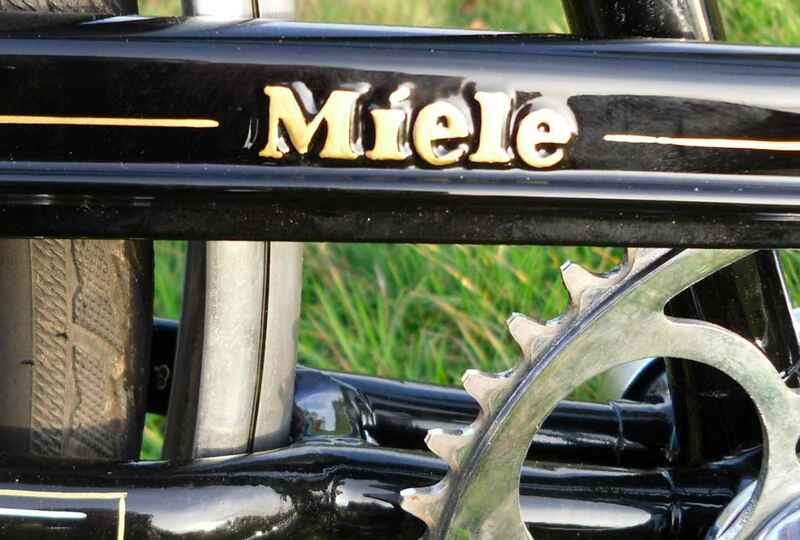 It also had passable Miele marked saddle and pedals. 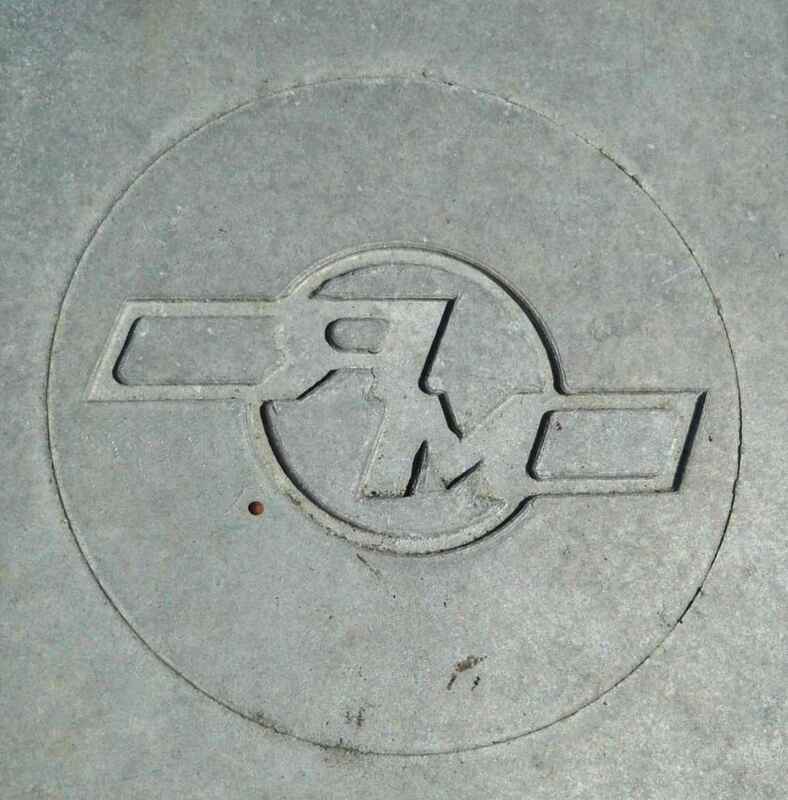 I don´t use these now as I plan on riding the bike. 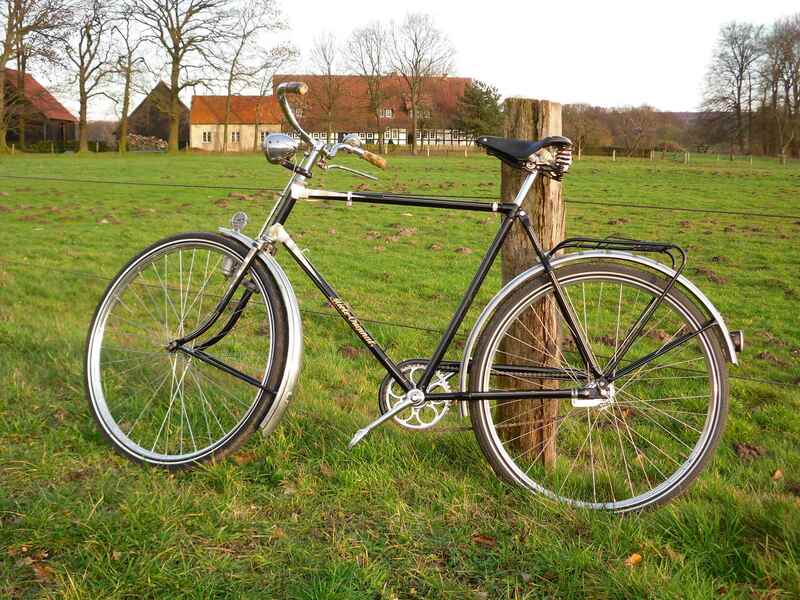 returned from Velo-Classic in early autumn I though I could build the thing up and ride it, but I found a number of small parts were still missing, and I had to find the time, too. So I only finished the bike last weekend. 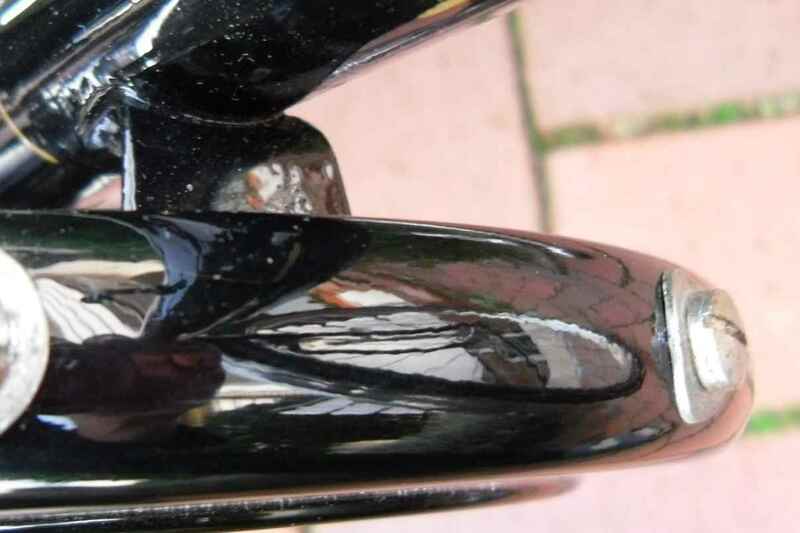 The paintwork on the chainguard is perfect in reality; it´s just my photography that makes it look odd. 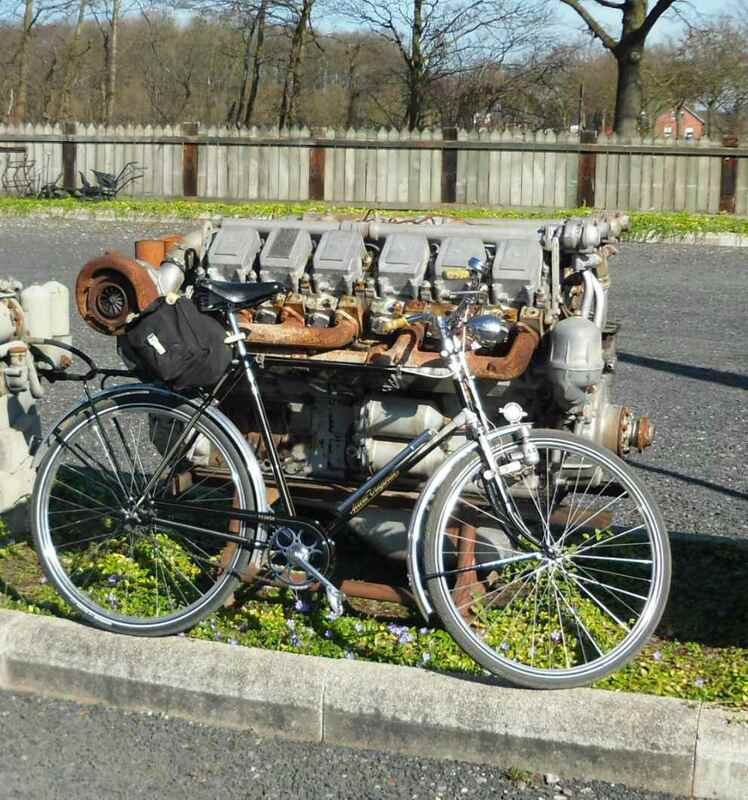 Contrary to what I found on the bike I also though I might like a three speed. 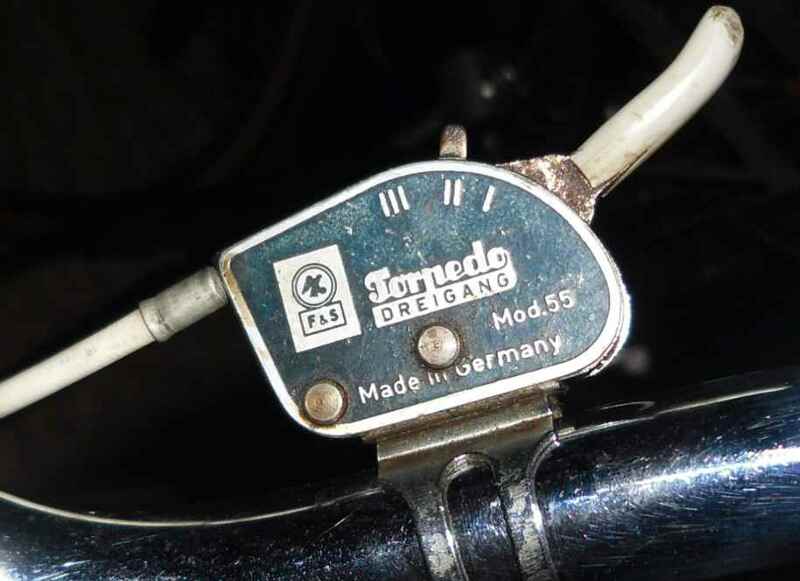 The frame number showing that the bike must have been made around 1958, a Fichtel und Sachs Model 55 was the hub of my choice. 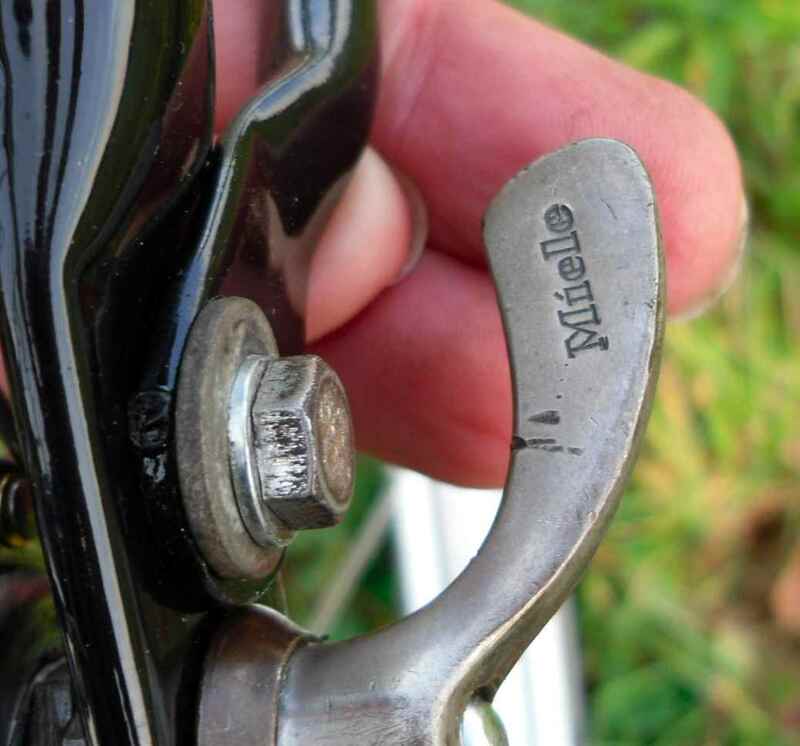 I stll had the trigger and the beautiful wingnuts in my boxes – I think these must be the parts I have kept the longest of all spares. 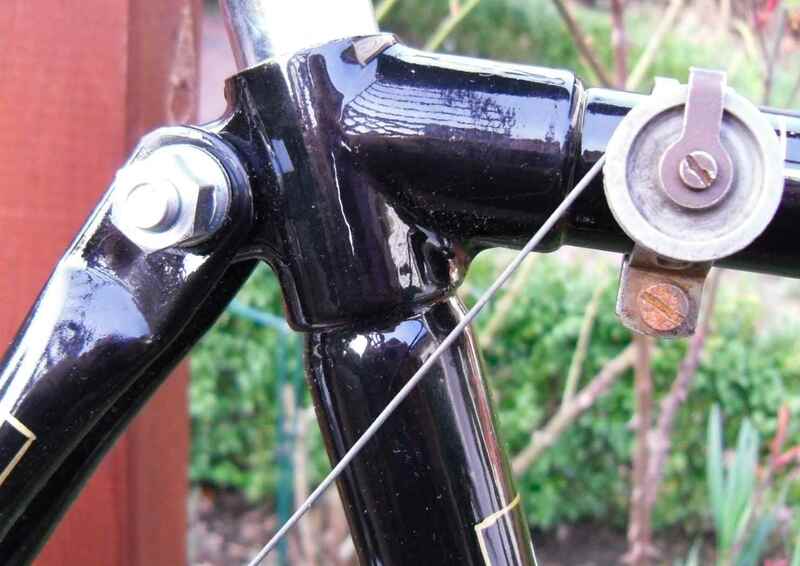 I can remember getting them in the mid-eighties, and I have never touched a Modell 55 three speed since. Headlight and dynamo, slightly too old for the bike, came out of a box I took over for next to no money from someone who wanted to build up a bike for his wife but gave up after 20 years or so. The bad chrome stands out, but it´s not too bad. It passes the three foot test in any case. 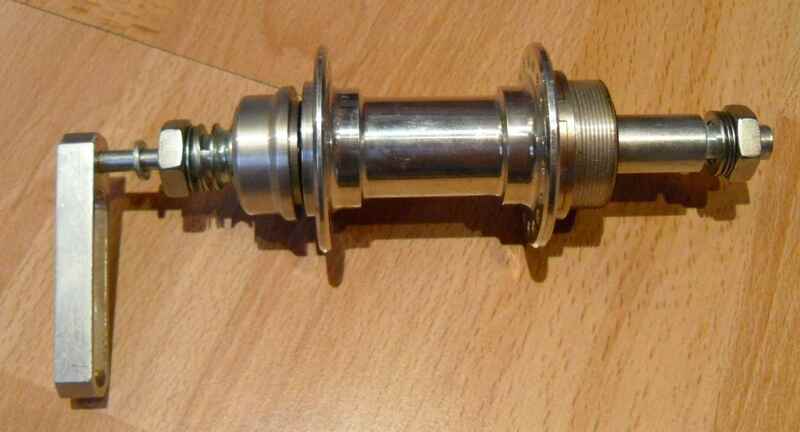 A crimped seat tube, flattened seat stay ends – not overly nice. The same goes for the fork, the crown cover of which still gives an impression of what the whole bike looked like when I got it. 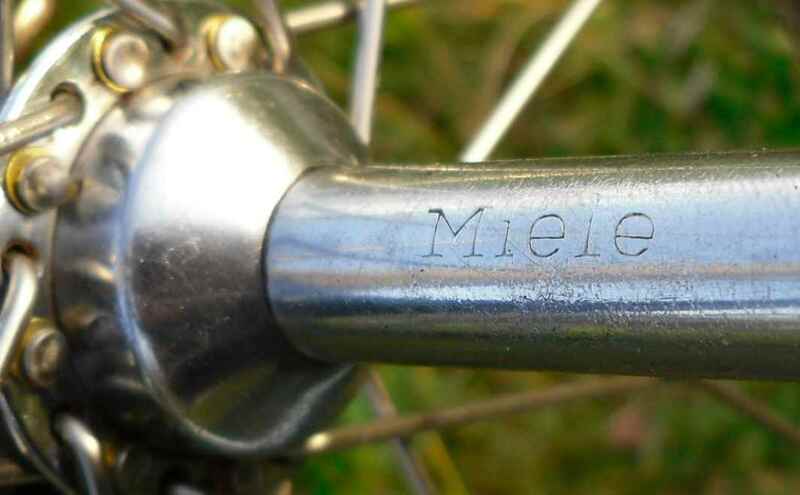 The whole front fork was not made in house at the time, only the special Miele headstock thread was still used. 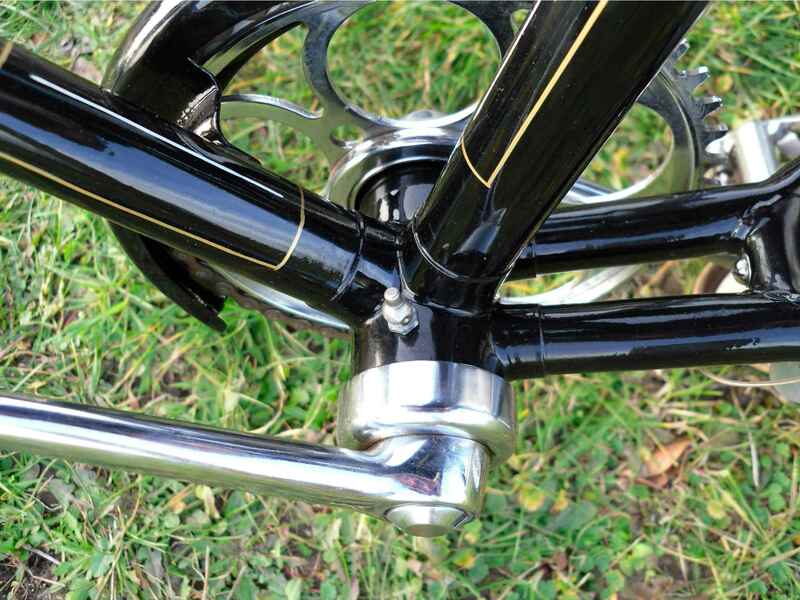 Also the front dropouts are just flattened tube. The wing nut really belongs on a sports bike, but it looks good also on a roadster. 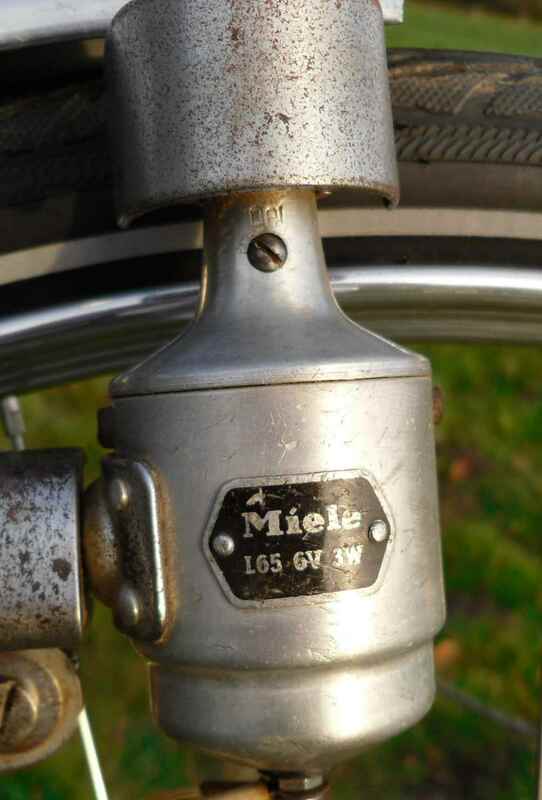 BTW, the front hub marked Miele is too early and comes off a wrecked sports bike. 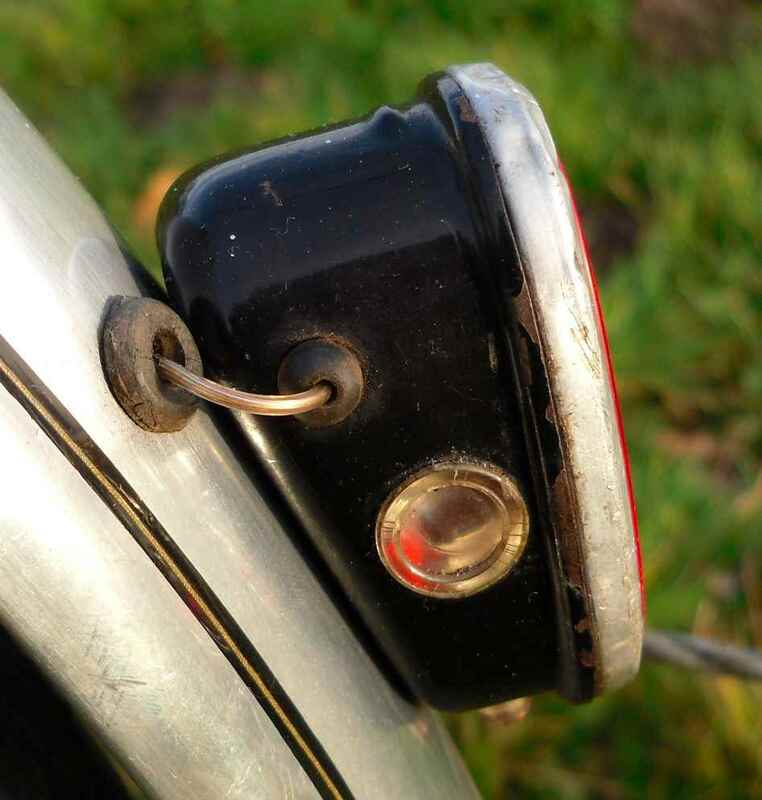 OTOH, there still are some quality details to be found on this top of the line bike. 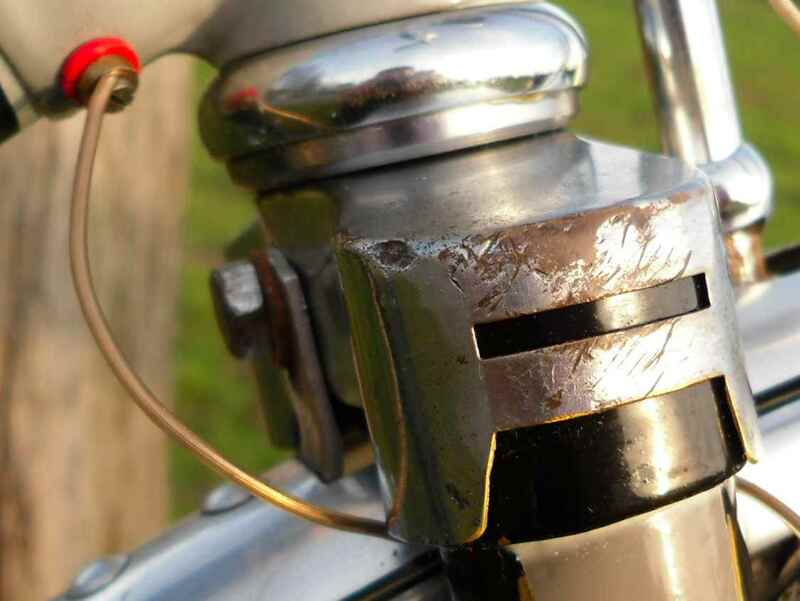 Look at the chainguard braze on for instance. The little shaped washers also are original. 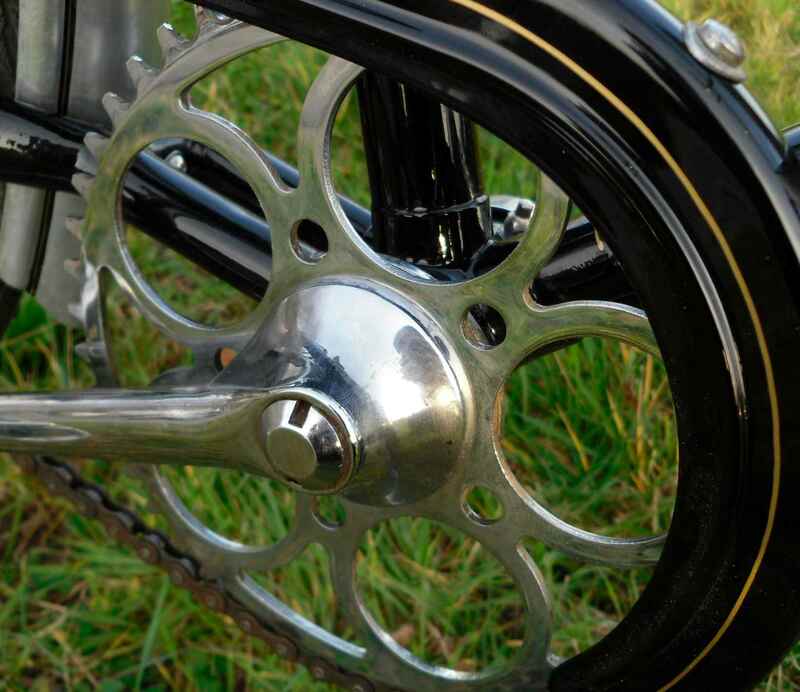 Also the b/b and chainset is good old locomotive grade quality. 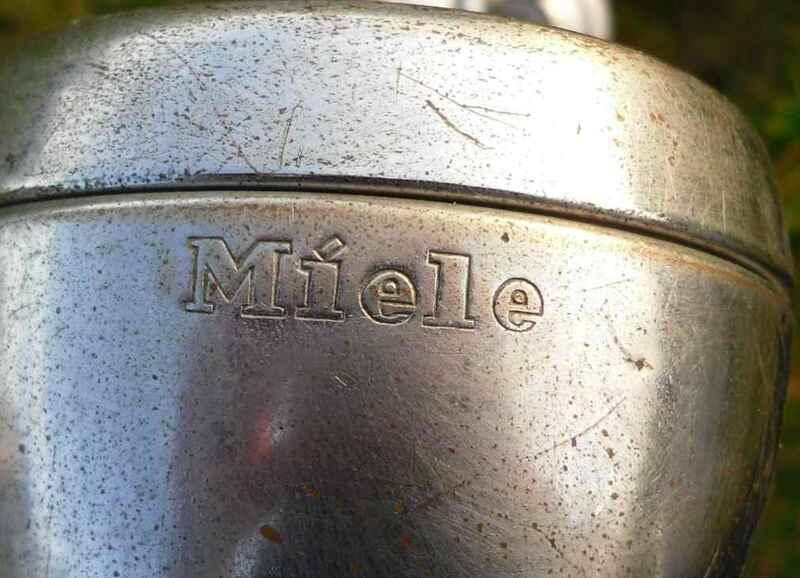 Now there´s just some typical Miele details left to show. In case you ask yourselves where the tool pouch is: I haven´t got one yet. I´ll be taking the bike out for its first shakedown ride this afternoon, let´s see how it is. 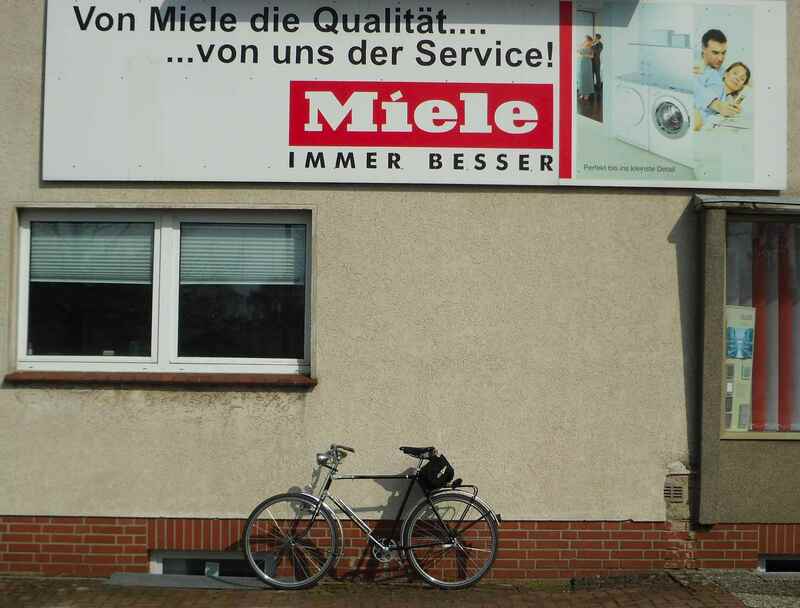 Postscript: I visited a friend in a neighbouring town this afternoon who had a few Jazz records for me (that´s the parcel on the luggage rack under the Carradice), and the Miele is great. 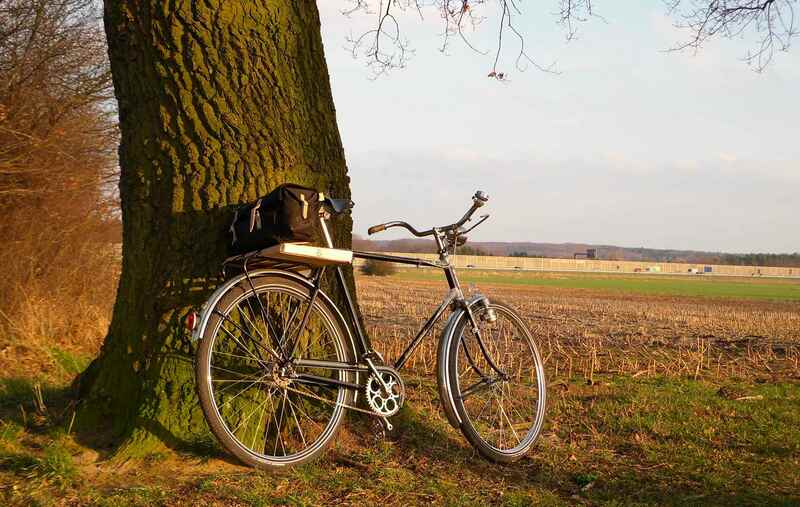 It does need a longer seatpin, that´s for sure, but the bike rides easily and relaxed. It feels safe downhill, no shimmy, it follows bends even at speed, and is quite OK uphill, too. Having made a point of visiting the former owner on this maiden voyage of the resurrected bike, ringing him to make sure he was at home, I actually met him on the road. 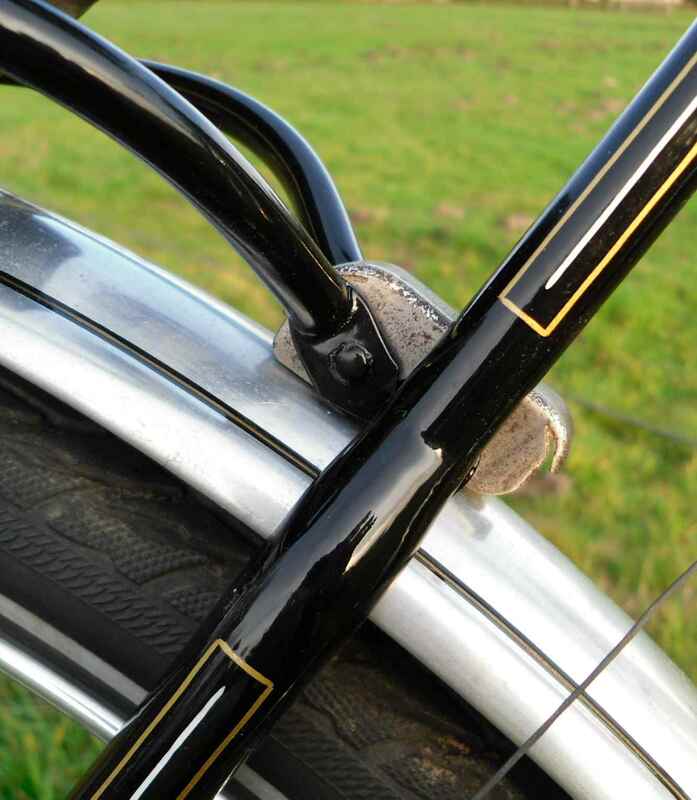 He recognized his old steed by the mudguard mascot and stopped me. He now rides an electrically assisted cycle being not the youngest anymore. He said that he had bought the bike at a lost and found office auction in 1969, for the princely sum of five Marks. 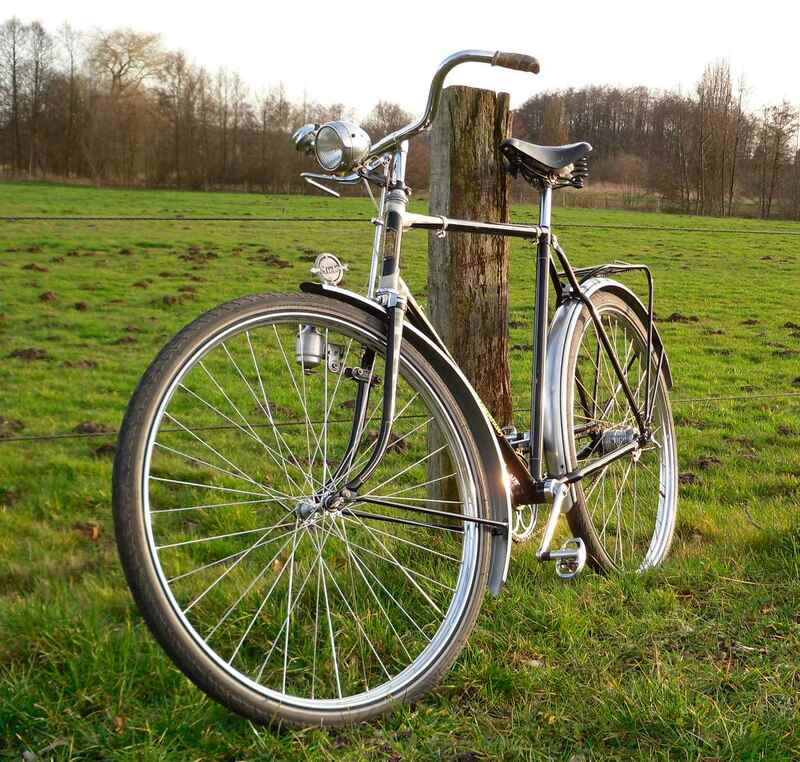 Later his son used it when a university student, and even though the bike had suffered, he wanted it back after his son had bought a glitzy new cycle. 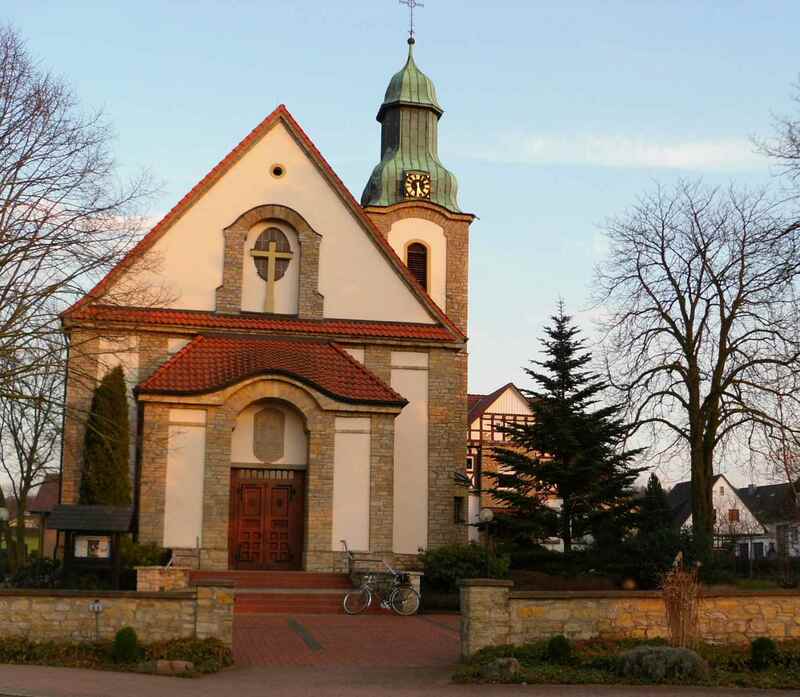 Due to the too short seatpin I curtailed the ride and only did about 40 km, passing by this church (which actually dates from the early 20th cent) in a neighbouring village. 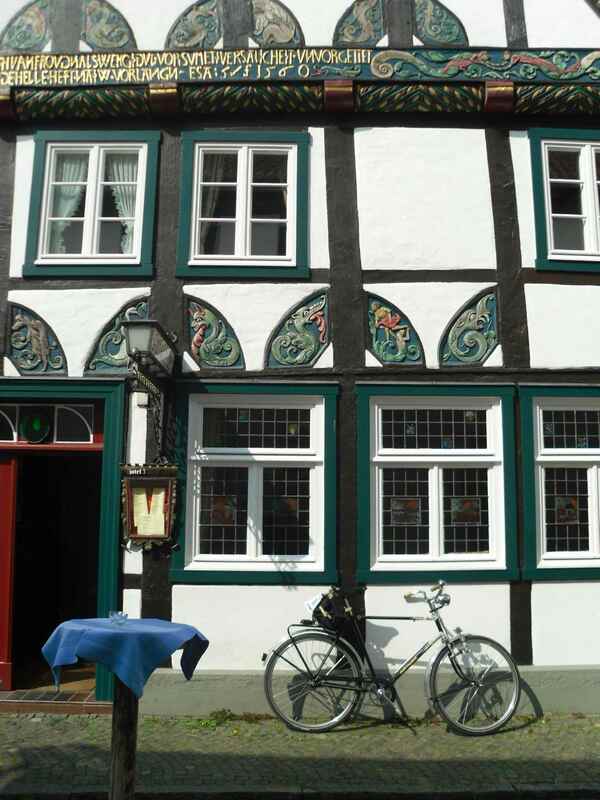 And, added a few weeks later, here´s a pic taken in Wiedenbrück, a beautiful town with a marvellous center full of historic half timbered buildings.